Cutting an audio file online is very easy, but sometimes it’s too slow because of the large size of your music file and extremely bad Internet connectivity. Besides, it may leak your private information to the web when you process your audio clips on the Internet. If you also think so, you may want to find an audio cutter tool offline instead. Thus, here we’re going to introduce 5 easy-to-use free audio cutters to help you cut any song, music or other audio file without any hassle. The first free audio cutter software recommended here is Audacity. This is a useful, open-source audio cutter freeware as well as multi-track audio recorder and editor. Developed by a team of volunteers, it is available for Linux, Windows, Mac OS X and other operating systems. With Audacity, uses can do the easy audio editing like cutting, copying, paste and deleting. You can also merge several audio clips together and export your sound files in multiple file formats such as WAV, AC3, M4A/M4R (AAC), AIFF, AU, FLAC and Ogg Vorbis etc. 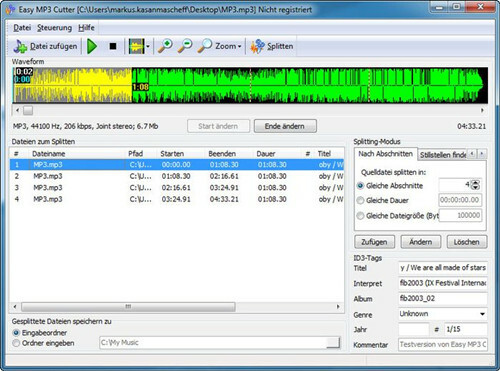 Weeny Free Audio Cutter is also an easy-to-use free audio cutter for PC, works well on Windows 10, 7, Vista and XP (both 32 and 64-bit versions). The video cutting software is able to cut large music files into smaller fragments, slice off any unwanted parts of the audio file and merge the audio tracks into a new one without effort. Therefore, it is very easy to make personalized ringtone for mobile phones or process long and large audio recording files. 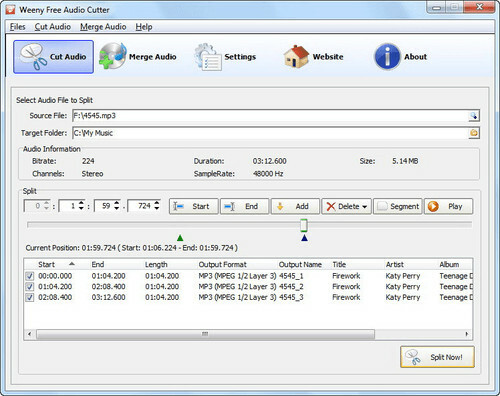 Weeny Free Audio Cutter supports several audio file formats including MP3, OGG, WAV and WMA. As its name suggests, Easy MP3 Cutter is easy and useful free MP3 audio cutter software for Windows 8/7/Vista/XP/2000, but it supports WAV types of files too. With the program, you can split a long audio recording file into several parts, and cut off the unnecessary portion of the audio etc. It also supports batch trimming of several music files. One of the most attractive highlights of Easy MP3 Cutter is that it is capable of finding silence automatically. If the cutting part of your audio file has a silent selection, it will detect it for you. 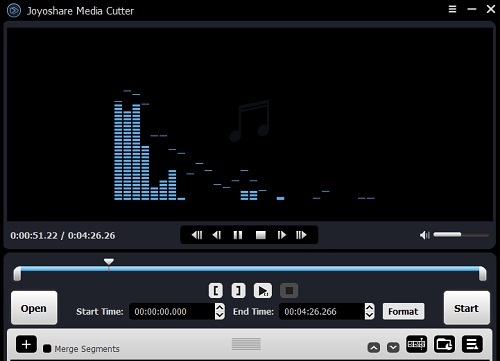 Compatible with Windows 98/Me/NT/2000/XP/2003/Vista/Server 2008/7/8, Free Audio Cutter is a quite straightforward audio cutting tool for beginners and amateurs. You can use it to trim your audio files, edit out specified segments, and remove noises from an audio clip with a few clicks only. The program can detect your hardware configuration and then opt for an optimal cut scheme for you. Besides, Free Audio Cutter supports lots of audio file formats such as MP3, WAV, WMA, OGG, FLAC, AAC, WAV, CDA, M4A, RA, RAM, APE, CUE, AC3, AIFF, AU, MP2 and MPA. 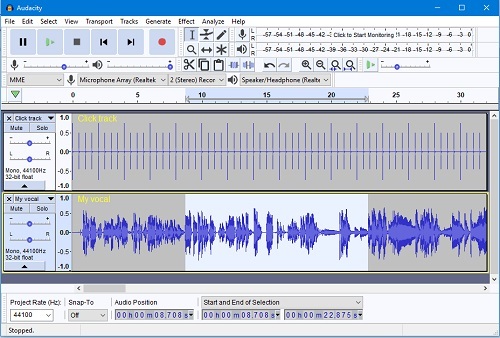 This is a totally free audio cutter, available for Windows 10/8/7/Vista/XP. 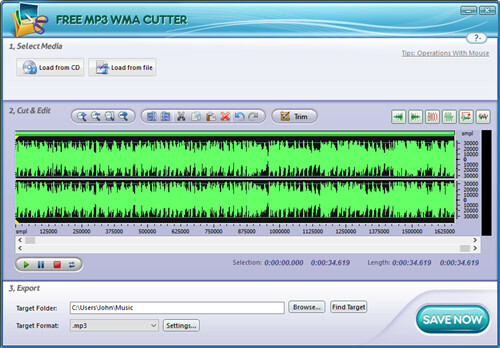 With Free MP3 WMA Cutter, you can cut any music file into small clips for ringtones, visually edit the audio files as you like, and convert various audio file formats for your music player, etc. You can also add some sound effects to enhance your audio file. The name only implies MP3 and WMA, but actually it supports a large number of audio file formats, like MP3, AAC, FLAC, OGG, WMA, WAV, AIFF, MP2, M4A, CDA, APE, AC3, RA, RAM, VOX, TTA and more. The advantages and disadvantages of these free audio cutter software for Mac and PC have been clearly listed out. If you can find one that meets your requirements from the list, then go for it. Otherwise, you can try another paid audio cutter tool like Joyoshare Media Cutter. Joyoshare Audio Cutter is a smart audio cutting program to split long audio file into short sections without any quality loss at 60X faster speed. You can also use it to cut out any unwanted parts of it and join the rest part you want together. Additionally, Joyoshare Media Cutter also allows you to extract the noise from the audio or replace the original audio tracks with a new one.